I am sharing a shaker card today with you using Taylored Expressions stamp set. 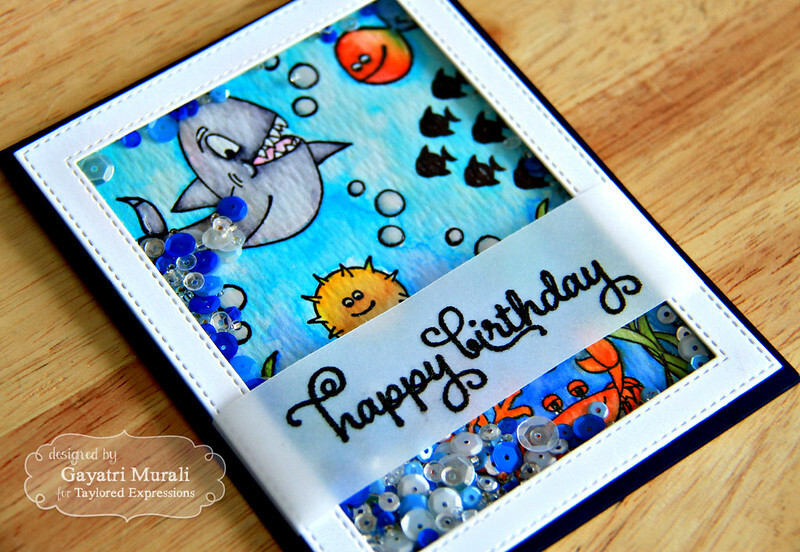 I have been seeing a lot of sea creatures, fishes and water based cards all over the place. They all look gorgeous especially with watercolour technique used to create a scene. 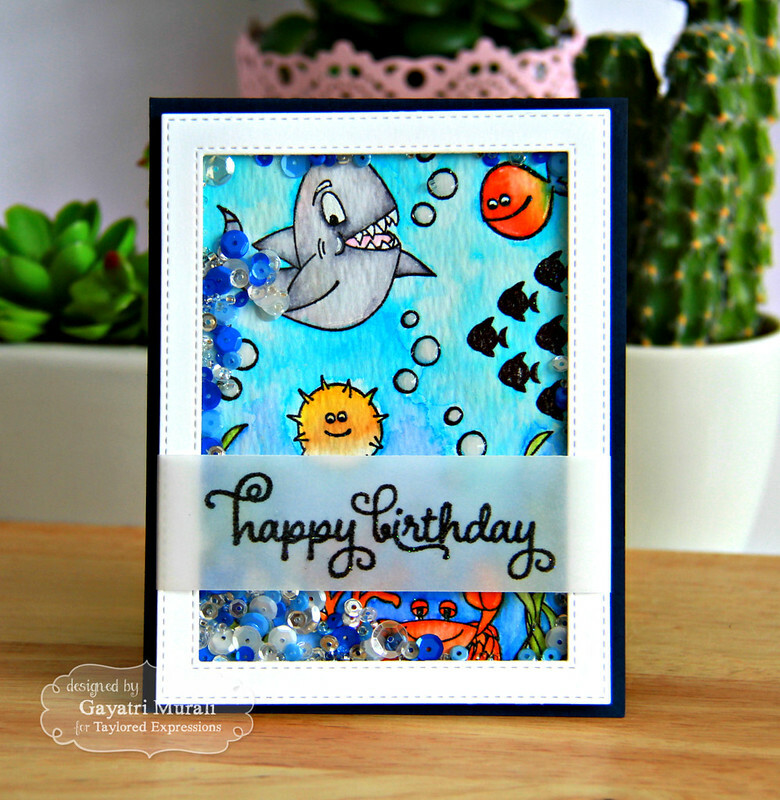 I jumped into the band wagon and created a shaker card using Taylored Expressions Under the Sea stamp set. I used watercolour card stock upon which I stamped all the images from the stamp set using black Versafine ink. The images are heat embossed so I can watercolour them. Zig pens come handy to quickly watercolour especially the tiny nooks and corners. I used zig pens to watercolour the background too. Of course, I could have used masking fluid or rubber cement to mask off the images and watercolour the background. But I did not have the time nor patience for it. And Zig pens make it easy to acces the tiny nooks anyway. So I went ahead and coloured the entire background using three different hues of blue. One the bubbles, I added some glossy accent for add dimension. The frame is die cut using MFT dies. The sequins inside the shaker card is from Pretty Pink Posh. They are Corn Flower blue, Winter Mix without the snow sequins, Cobalt, Sparkly Clear, Silver, Sparkly Clear seed beads and Silver Shimmer seed beads. BTW: Last night, my friend LOVED house warming card and everyone loved my carrot halwa. It was a pleasure to see everyone enjoying it.